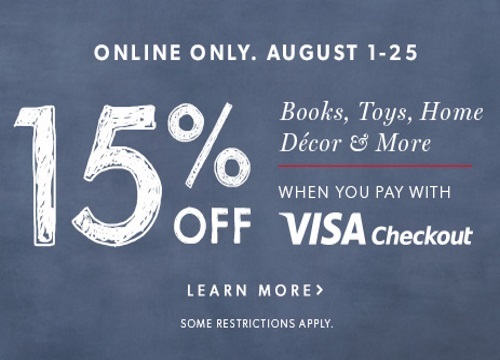 Chapters Indigo is offering 15% off books, toys, home, decor and more when you pay using Visa Checkout. Excludes eBooks, Apple products and accessories, gift cards, American Girl® Specialty Boutique Dolls, Clothing, Accessories, LEGO, irewards membership, and Love of Reading products and donations. Limit: one discount per customer. Offer is valid online only until August 25, 2016.